NETWORK FINALS: SHARK TANK and DATELINE gained 0.1 in final numbers, while 20/20 lost the same. CABLE HIGHLIGHTS: Discovery’s GOLD RUSH continued to dominate regular Friday cable programming, up 0.09 from last week to 1.07, with lead-out THE WHEEL up 0.03 to 0.38. ESPN’s NBA game was at 0.60, and its lead-out coverage of the X GAMES was at 0.44. HBO’s REAL TIME WITH BILL MAHER slipped 0.05 from Inauguration Night to 0.44. We should probably get used to Fox News being a regular player in the Top 10 for a while, with 2 hours landing there on Friday, topped by THE O’REILLY FACTOR at 0.42 (and with 3.7M total viewers). On Lifetime, BRING IT rose 0.03 to 0.41, and THE RAP GAME was up 0.07 to 0.40. HGTV’s HOUSE HUNTERS was at 0.39, and HOUSE HUNTERS INTL was up 0.11 to 0.37, with MY LOTTERY DREAM HOUSE up 0.05 to 0.34. On Food Network, DINERS, DRIVE-INS & DIVES dropped 0.05 to 0.36, and GINORMOUS FOOD held at 0.33. 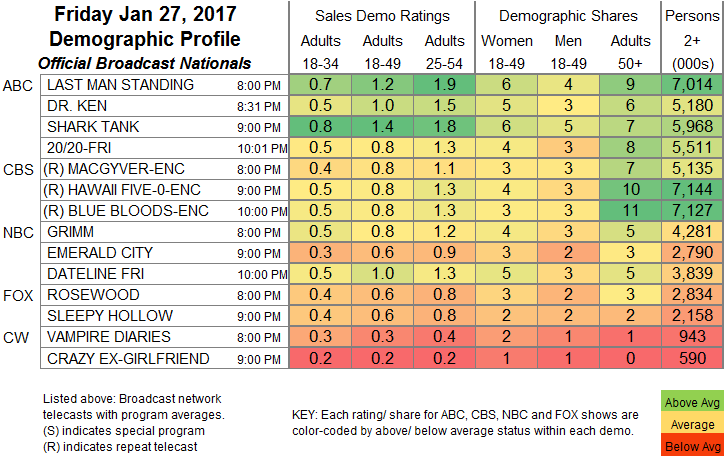 A&E’s LIVE PD edged up 0.02 to 0.31. On ID, FORBIDDEN: DYING FOR LOVE fell 0.03 to 0.28. 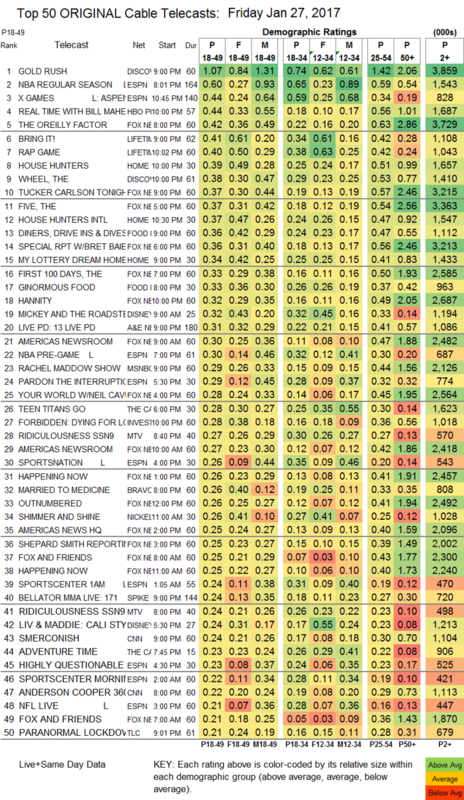 MTV’s RIDICULOUSNESS was at 0.27/0.24, compared to last week’s 0.33/0.28. Bravo’s MARRIED TO MEDICINE dropped 0.11 to 0.26. Spike’s BELLATOR LIVE was at 0.24. TLC’s PARANORMAL LOCKDOWN lost 0.04 to 0.21, and the AFTER-SHOW ticked down to 0.19. We’s MARRIAGE BOOT CAMP was up 0.02 to 0.20.